By Todd Abelson NMLS #180858 on January 28, 2019 . The stock and bond markets leveled off and traded mostly flat during a holiday-shortened trading week as investors worried over evidence of slowing global economic growth. The International Monetary Fund lowered its forecast for global growth in the coming year from 3.7% to 3.5% while China reported its economy only grew 6.4% year-over-year in the final quarter of 2018 – its slowest growth rate in almost 10 years. As far as trade negotiations with China are going, on Thursday Commerce Secretary Wilbur Ross commented the U.S. and China are “miles and miles away” from a trade agreement. One of the major sticking points seems to be compensation for China’s theft of U.S. intellectual property. In housing news, Existing Home Sales were reported to have fallen 6.4% month-over-month in December to a seasonally adjusted annual rate of 4.99 million. 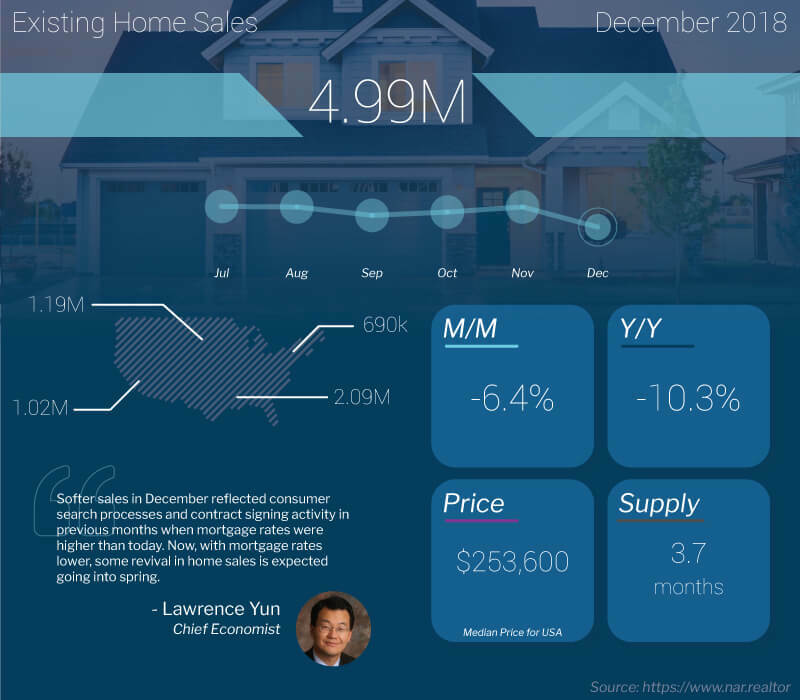 This was below the consensus forecast of 5.25 million and lower than an upwardly revised 5.33 million reported for November. Also, total sales were 10.3% lower than the same period from a year ago. The median existing home price for all housing types increased 2.9% year-over-year to $253,600, achieving the 82nd consecutive month of year-over-year gains. The median existing single-family home price rose 2.9% year-over-year to $255,200. Regionally, Existing Home Sales fell 6.8% in the Northeast; were 11.2% lower in the Midwest; fell 5.4% in the South; and declined 1.9% in the West. Meanwhile, median home prices rose 8.2% in the Northeast to $283,400); were unchanged in the Midwest at $191,300; increased 2.5% to $224,300 in the South; and advanced 0.2% to $374,400 in the West. Single-family home sales were lower by 5.5% month-over-month to a seasonally adjusted annual rate of 4.45 million, and year-over-year they were down 10.1%. The inventory of homes for sale at the end of December dropped to 1.55 million from 1.74 million with inventory up 6.2% from a year ago. Unsold inventory was reported at a 3.7-month supply at the current sales rate versus 3.9 months in November. 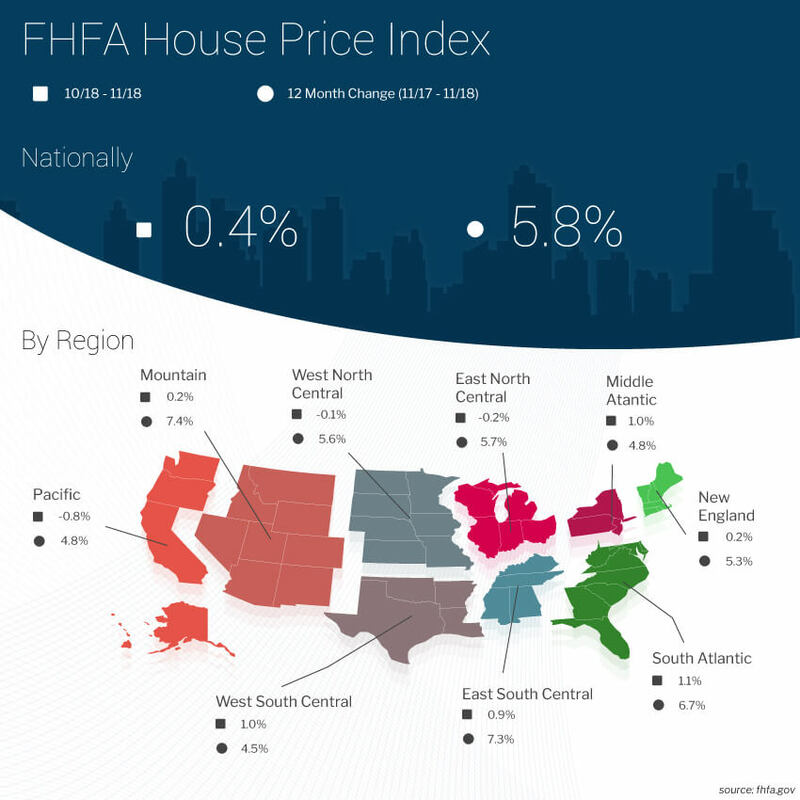 Wednesday, the Federal Housing Finance Agency (FHFA) released its latest House Price Index (HPI) for November 2018 showing house prices rose 0.4% from October. The previously reported 0.3% increase in October was revised to reflect a 0.4% increase. From November 2017 to November 2018, house prices were up 5.8%. As for the latest mortgage data from the Mortgage Bankers Association (MBA), the weekly mortgage applications survey showed the number of mortgage applications decreased from the prior week. The MBA reported their overall seasonally adjusted Market Composite Index (application volume) decreased 2.7% for the week ended January 18, 2019. The seasonally adjusted Purchase Index decreased 2% from a week prior while the Refinance Index decreased 5%. Overall, the refinance portion of mortgage activity decreased to 44.5% from 46.8% of total applications from the prior week. The adjustable-rate mortgage share of activity decreased to 8.3% of total applications from 9.2% the previous week. According to the MBA, the average contract interest rate for 30-year fixed-rate mortgages with a conforming loan balance increased to 4.75% from 4.74% with points decreasing to 0.44 from 0.45 for 80 percent loan-to-value ratio (LTV) loans. For the week, the FNMA 4.0% coupon bond remained unchanged to close at $101.672 while the 10-year Treasury yield decreased 3.0 basis points to end at 2.758%. The Dow Jones Industrial Average gained 30.85 points to close at 24,737.20. The NASDAQ Composite Index added 7.63 points to close at 7,164.86. The S&P 500 Index lost 5.95 points to close at 2,664.76. Year to date (2019) on a total return basis, the Dow Jones Industrial Average has added 6.04%, the NASDAQ Composite Index has gained 7.98%, and the S&P 500 Index has advanced 6.30%. This past week, the national average 30-year mortgage rate rose to 4.61% from 4.60%; the 15-year mortgage rate increased to 4.17% from 4.16%; the 5/1 ARM mortgage rate remained unchanged at 4.40% while the FHA 30-year rate increased to 4.20% from 4.18%. Jumbo 30-year rates increased to 4.39% from 4.34%. 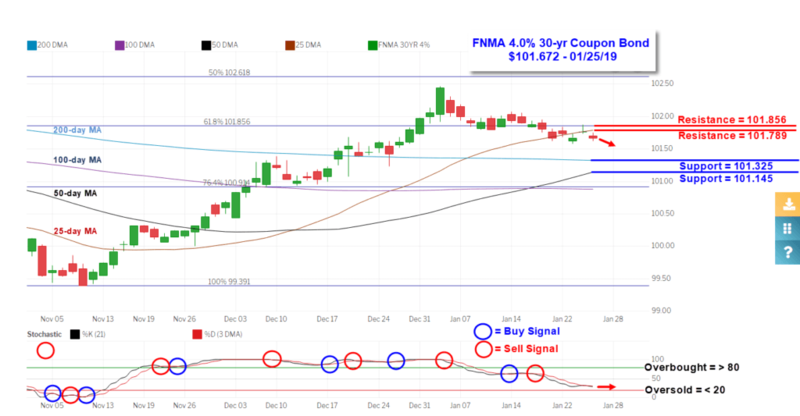 The FNMA 30-year 4.0% coupon bond ($101.672, Unchanged) traded within a narrower 29.7 basis point range between a weekly intraday high of $102.875 on Thursday and a weekly intraday low of 101.578 on Wednesday before closing the week at $101.672 on Friday. Mortgage bond prices traded in a sideways direction while encountering a dual band of technical resistance at the 61.8% Fibonacci retracement level ($101.856) and the 25-day moving average ($101.789). Support levels are found at the 200-day moving average ($101.325) and the 50-day moving average ($101.145). The stock market may see some strength early in the week in response to the deal to end the partial government shutdown for at least the next three weeks, and this could pressure bond prices a little lower unless traders sell into strength. 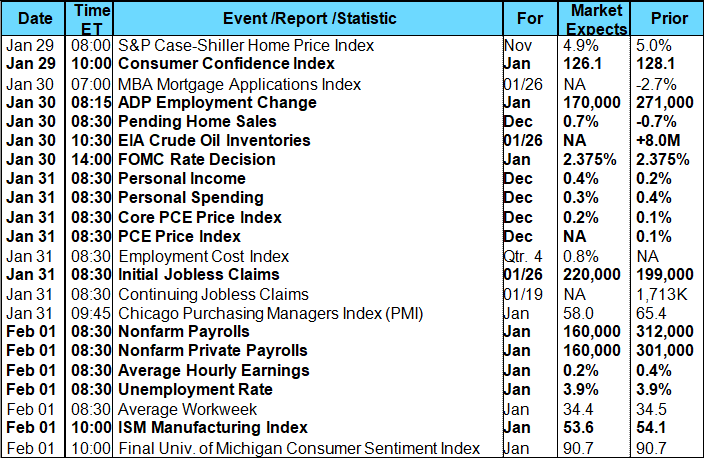 Also, there are a substantial number of significant economic reports scheduled for release this coming week highlighted by the Employment Report for January on Friday. We could see a stronger than expected report that could initially send stock prices higher and bond prices lower, but market reactions may be tempered by concerns about future inflationary pressure and the Federal Reserve’s view of a strong jobs report. From the technical chart below it appears bond prices will trade between resistance and support levels with a bias toward lower prices and this should result in mortgage rates holding relatively steady or moving slightly higher.